The Coin Slot Chronicles series, by former NFL running back and Dancing with the Stars champion Rashad Jennings, is a humorous and imaginative series that explores the power of friendship and imagination, the challenges in finding your place, and the reality of missing home. Eleven-year-old Arcade Livingston has a problem. Several, actually. The Tolley twins, a.k.a. neighborhood bullies, are making Arcade's move to a new city even harder than it needs to be. They expect him to do their research papers and interactive displays for the sixth-grade career expo's theme: "What do you want to be when you grow up?" Besides doing their work, Arcade doesn't even know his own answer to that question. Then at the library--Arcade's favorite place to chill--a mysterious old woman gives him a golden arcade token that grants him a unique gift. A gift that allows him to time travel between different places including his own future. From sitting in the dugout with Babe Ruth, to hanging on to the back of a bucking bull, to performing life-saving surgery on a dog, Arcade has no shortage of adventure! Together with his older sister, Zoe, Arcade explores life's biggest thrills and challenges, and the two also have a big mystery to solve. Who is the rightful owner of the incredible Triple T Token that leads to such astounding adventures? Arcade's circle of friends begins to widen as the Triple T Token hangs from his neck. Pulsing. Beckoning another adventure. The question for Arcade, Zoe, and their new friends is no longer, "What do you want to be when you grow up?" It's, "Where will we go next?" Are you ready to go on an adventure - an adventure with God? His Word is all you need to tackle this journey that we are all on - the journey of life. Read his instructions and then discover God's rescue plan for the world through his Son Jesus Christ. When you're exploring God's Word - get ready for the ride of your life! The Bible Explorer's Guide lets children come up close and personal with everyday life during Bible times through photos, maps, and illustrations illuminating, people, places, objects, and buildings of the Bible. What did Noah's Ark really look like? Who was David and whom did he fight? How did 1st century citizens of Jerusalem live? Each two-page spread is filled with images that bring history alive and drawings that help bring life to people and places that we can only read about. With fascinating, brief text and full-color captivating images, this is a reference that kids will come back to again and again. A great addition to any home or school library. 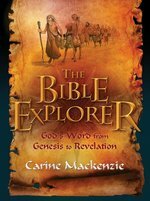 The perfect reference for reluctant readers and visual learners interested in discovering the history of the Bible and its people, The Bible Explorer's Guide People and Places will fascinate children 8 and up.